LEICESTERSHIRE UNDER 15’S SHIRES FINALS DAY! Well, what an achievement for this group of players to make the finals day! The first time that this has happened for this cohort. A top eight finish was guaranteed out of the 39 county teams. Following a great performance in the play offs against Yorkshire, on paper it was always going to be tough playing against one of the top four seeded teams. Would it be Cheshire, Essex, Warwickshire or last years winners Bucks? The tension mounted as the draw was made. A loud cheer came up when the seeded Bucks were drawn against a very strong Surrey team. Cheshire drew Avon. Warwickshire drew Oxfordshire. Essex drew Leicestershire. The match reporter felt slightly jaded from the Leicester City celebrations – could this Leicestershire team emulate those achieved by Leicester City too? The first match against Essex would ultimately determine either a 1-4 or a 5-8 position finish. A pre match huddle team talk by Laura was supported by Mark. Despite the superior gradings and rankings of the Essex team Leicestershire stuck to their strengths and kept in touch throughout the mixed finishing 2-2. All matches were close with the number 1 pairing of Martin and Ella securing the first victory winning 21-16. The final game in the mixed featuring Hritika and Daniel secured the 2-2 with a further 21-16 win. Next up the singles. This looked tough on paper! Martin lost his game but this was quickly levelled up by a great win by Sameer. Tom C and Daniel lost against their opponents so Leicestershire really needed the girls to overcome their strong opponents. Hritika brilliantly beat her opponent 21-17 to bring the match score back to 4-5. Ella, Eve and Jas all fought well against their opponents but none could produce the vital wins. The match score after the singles was 4-8. Doubles have always been strong for Leicestershire and would really need to pull out the stops to claw back the overall match from being 4-8 down. Three wins for Leicestershire out of the first four matches kept the dream alive of a top four finish. Notably, Martin and Tom C beating their opponents convincingly 21-14. The girls pairings of Eve and Hritika, and Ella and Jas beating their pairings too. The match score was now closer at 7-9. To progress, Leicestershire would need to win maybe all of their last four matches or three out of four with very convincing points differences. The team got off to a good start with Martin and Tom C bringing the match score back to 8-9. Daniel and Tom L’s battled well against the Essex number 1 pair but couldn’t overturn them. Therefore, Essex were now 10-8 up. At this stage both managers were nervously totting up the points scored situation and the reality set in that unless both pairs of Leicestershire girls won by a 15 point margin then Leicestershire couldn’t overtake Essex. Jas and Ella did win though in a close fought battle 21-19 to bring the tie back to 9-10 but Eve and Hritika couldn’t level the match eventually losing 21-18. A great fight by Leicestershire. A much improved score line against their playoff opponents from two years ago, narrowly losing 9-11! Well done! The next draw by the organisers was to determine whether Leicestershire would be competing for the 5th and 6th positions or 7th and 8th. A guaranteed 5th or 6th would result if Avon could be overcome. Could the mixed pairings get off to a good start?? There was a lot of double takes when Eve and Tom L quickly arrived back at the bench following a bizarre 21-1 win. Ella and Martin, and Hritika and Daniel also won to take the match score to 3-1 after the mixed, following a narrow loss for Jas and Tom C.
Great singles wins by 7 of the 8 Leicestershire players guaranteed at least the draw. All four girls winning against their opponents convincingly. The boys games were tighter with an excellent victory for Daniel beating a higher graded opponent. Wins were also achieved by Martin and Tom C. This making the match score 10-2. The doubles started well with both boys pairs winning. The girls match points were shared with Jas and Ella winning, but Eve and Hritika losing. The match score then sat at 13-3 to Leicestershire. Three of the four reverse doubles match wins also went to Leicestershire making the final result a strong 16-4 victory. Bucks, following a narrow loss to Surrey in the first match of the day meant a lower finishing position for a very strong Bucks team. Could Leicestershire beat the odds against the higher graded Bucks players? This match was to determine the 5th and 6th final positions. Despite scoring double figures in all matches Leicestershire were only victorious in two of them. These being Hritika and Daniel in the mixed winning 21-12 and in the final game of the match with Eve and Hritika winning 21-14 in the doubles. Though, a number of other matches are more than worthy of a mention. Firstly, Hritika gaining 16 points against a C grade girl in the singles, and Martin and Tom C narrowly losing 21-19 against international players in the doubles. A fantastic 6th place out of 39 counties was indeed an excellent result for this great bunch of players and great manager too! This team could be formidable if this level of improvement continues! Roll on next year! Match report by Mitch Dale. 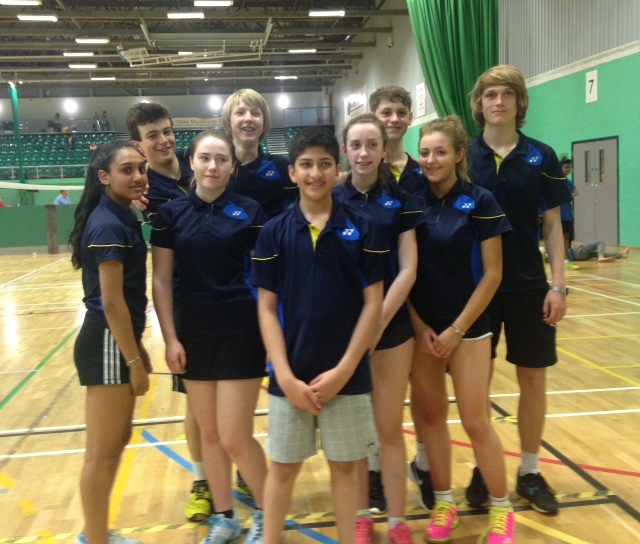 Team players:- Hritika, Tom L, Jas, Tom C, Sameer, Eve, Martin, Ella and Dan. Next Next post: U12’s do battle in York!